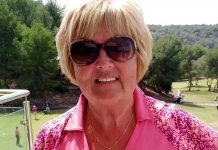 On Tuesday 4th October 75 players joined in the weekly stableford Toffs game. The results were Cat 1 1st David Gregson 36 2nd Pete Cleaver 36 c/b 3rd Paul Manniung 35 c/b Cat 2 1st Clive Peck 33 2nd Ian Turner 32 c/b 3rd Harry Armstrong 32 c/b Cat 3 1st Bev Fairhurst 38 2nd David Valentine 34 3rd Chris Stanley 32 Overall winner Bev Fairhurst Best front 9 David Blanchette 19 Best back 9 Colin Hobden 17 NTP´s 5th Sue Gillette 11th Clive Horne 15th Bill Martin 17th Clive Peck Football draw D Blanchette K Enever B Martin and Robin Richards. Don’t forget to put your names down for the Spanish Flamenco evening at La Herradura on October 29th. 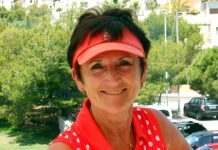 If you would like to play with Eurogolf at La Marquesa on Tuesdays and Thursdays please visit the website www.eurogolf-quesada.co.uk. 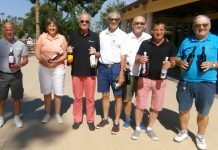 SAN MIGUEL GOLF SOCIETY AT VILLAMARTIN. OCTOBER 5TH, 2016. A perfect day weather-wise and with the course in its usual condition, 54 members and 4 guests gathered to play a stableford competition under the leadership of new Captain Theo Boelhouwer. 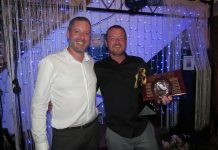 It seems members had no lasting hangover from the previous Saturday’s outgoing Captain’s dinner where Barry Roehrig handed over the reins to the new incumbent. 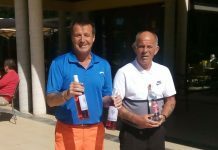 Excellent scoring ensued, with a couple of members of the Society’s Pink Quesada league team, which overcame the trophy holding SMGS Blue team in Monday’s first round of this year’s Quesada League, leading the way, Glenn Rapley and Roger Webb winning their categories. Glenn had the joint best score of the day along with Kyree Skarsmoen, their 40 points being followed by a host of other good scores, 29 members recording 32 points, the lowest category prize winning score, or above. At prize giving members Richard and Camel McCann kindly donated to SMGS’s charity pot by handing over their favourite piggy bank, the contents of which, 125 euros, will be given to one of the next charities SMGS’s Committee determines to support. 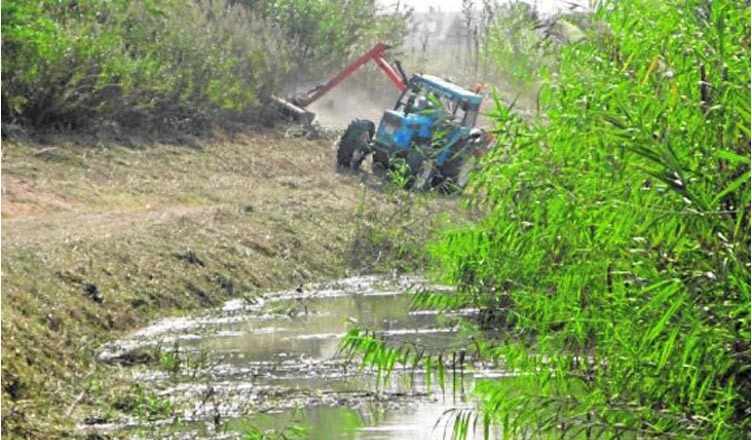 We thank them very much for their generous donation to a worthy cause. Bronze Category: 5th Chris Hamblett (32), 4th Mary Cleary (34), 3rd Jackie Rust (35), 2nd Brian Butler (38), and 1st, with joint best score of the day, Kyree Skarsmoen with 40 points. Silver Category: 5th Keith Wraithmell (36 on CB), 4th Nick Spicer (36 on CB), 3rd Ken Flaherty (36 on CB), 2nd Phil Birtwistle (39) and 1st, equalling Kyree in Bronze with 40 points, Glen Rapley. Gold Category: 5th Bjorn Petterson (36 on CB), 4th Jamie Rorison (37 on CB), 3rd Darren Hancock (37 on CB), 2nd Eva Petterson (37 on CB), and 1st, Roger Webb with 38 points. The Abacus was won by Les Wilton. Nearest the pins on the par 3’s (open to all) went to Norman Cahill (6 and 13), Les Wilton (9) and Brian Mulligan (17). The Best Guest was Alan McCombie, winning with 33 points. 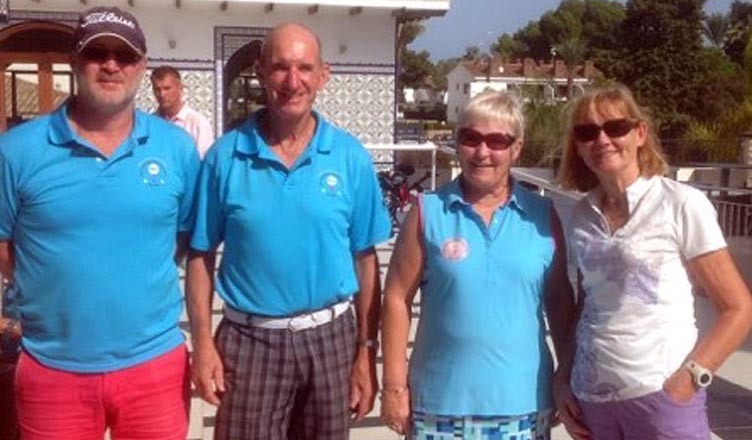 Our thanks go to the staff at Villamartin golf course for their contribution to the day. 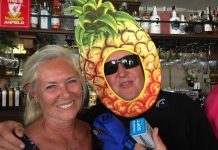 Keep up to date with all SMGS matters by logging on to our website www.smgs.org or simply give Theo a call on 966 723 630 to find out more about the society and its weekly golf get-togethers. Next week we will be at Mar Menor. An uneven 23 entrants left an unwieldy number for the Annual Captain v Vice Captain competition on 4th October. One lucky member found himself playing on behalf of the Captain for the 1st nine holes and the Vice Captain for the 2nd nine and so qualified for a winners prize whatever the result. Step forward Alan Janes. No matter how well you play in this competition while winning your individual match, you could end up without a prize if you were unlucky to be drawn on the losing side, as was the case with Mel Hope who beat his opponent 10 & 8 – for the Vice Captain’s side. The Captain John O’Brien beat Rod Loveday who is in charge of Vice in their individual match for the trophy. Nearest the pins : Hole 1 – Alan Janes, Hole 8 – George Van Haastert. 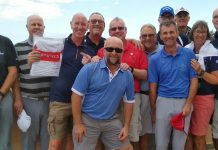 Members of the winning Captain’s side who triumphed 13 – 11 were – John O’Brien, Keith Smith, Ray Housley, Graham Blakeway, Martin Rickman, Ian Craig, George Stanhope, George Van Haastert, Gordon Wayne, Stewart Paterson, Penny Goujon. If anyone would like to join our Society, we play at El Plantio Golf Club on Tuesday, Friday and Sunday. 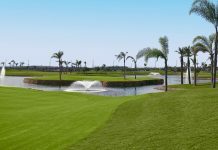 We use both courses – the Par 3 nine hole course and the main 18 hole course, so we cater for all abilities. The membership rates are very competitive, so call for more details. Anyone who wishes to play in the Society as a guest or join as a new member, contact Ian Henderson on 966 716 616 or 636 116 230. 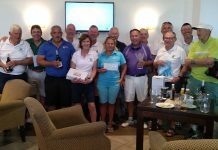 This new and latest established Society held their inaugural match at Alenda Golf. Although the course was not in the best of condition the players taking part managed to achieve some excellent scores. With two players getting 36 points,who incidentally were brothers in law,then the overall placings had to be decided on countback and on this occasion Jim Bremmer took the honours from Tony Foster. Nearest the pin prizes were won by Paul Dexter hole 3, Tony Foster holes 5 and 13, Ken Maguire hole 16. After the match all players returned to La Unica tapas bar for a welcome drink and some excellent food prepared and presented by Marina the Hostess of La Unica. We started the week with a 2 ball better ball which was played in perfect weather conditions. Unfortunately there were a few no shows largely due to excesses the previous evening drowning their sorrows after the Ryder Cup defeat. Nevertheless the pairing of Brian Dent and Peter Wickham came home with an excellent score of 46 pts to win by 5 points from Geoff Biggerstaff and Bryan Neal with 41 pts. There was a shock result in the preliminary round of our Pairs Knockout Match Play championship with last years winners Lindsay Forbes and Maria Oldenziel being eliminated by Reg Akehurst and Heinz Lei 3 & 2. The only other match saw Ron Phipps and Hendrick Oldenziel beat Yvonne Phipps and Rod Doel with the match going to an extra hole. The majority of our members played a Mulligan with Doug Wright taking first place with 36 pts. Mike Chapman was second with 35 pts and Ken Robertson third with 34 pts beating Peter Radcliffe on a count back. Match 1 of the 2016/17 season. What would it hold with a new team and rising green fees. It was certainly an early start arriving at the course in the dark for an 8.20am 1st and 10th tee. We managed to get off to a good start with all the Captains paying for their complete teams in one go, at last! As the dawn broke the course looked in excellent condition and no wind. All the teams got away from the 1st and 10th on time and the scores began to ebb and flow in the normal match play way. The sun came out and left us with the perfect golfing day. As the teams finished and the cards were scrutinised our new team had bagged first place. Well done Plaza Golf Society. 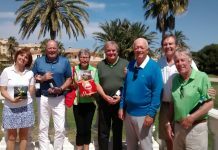 So with the presentation of the nearest the pins completed, prizes for which were donated by San Miguel Golf Society, the teams headed home. Our thanks to all the staff at Font del Llop Golf for giving us a good day. The date of the next match is the 7th November at Altorreal 10.00am tee. Results of nearest the pins and League Table below. 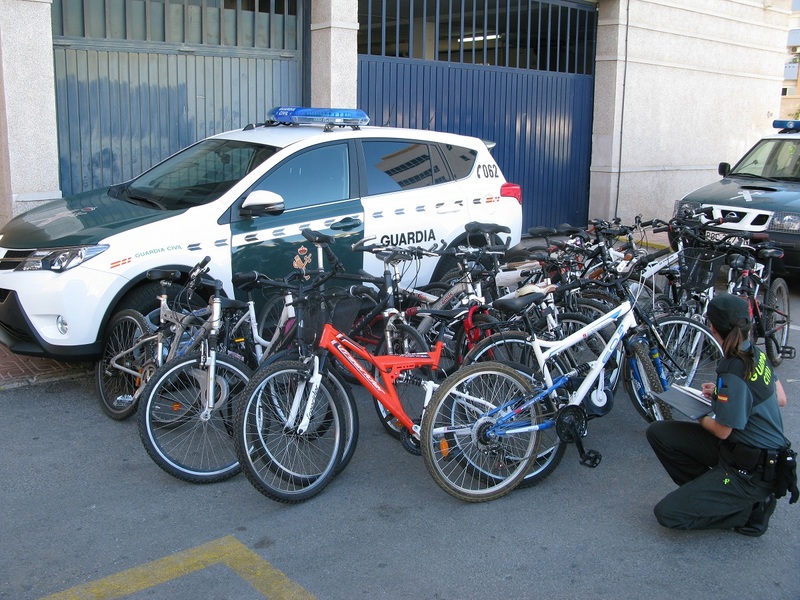 WONDERED WHAT HAPPENED TO THAT STOLEN BIKE?